If you update your app with new features, you can simply update your existing, published app in the Amazon Appstore rather than creating a new one. By updating your existing app (rather than creating a new one), you retain your app's customer ratings and download statistics across versions. You also enable your customers to receive app updates. Note: Apps cannot be updated while they are in the Amazon review process. Tip: Your "app" refers to your listing in the Amazon Appstore, which includes the title, description, categorization, and other details, as well as all the APKs associated with the app. In contrast, the "APK" refers to a single Android APK file. Thus, there's a difference between updating your app and updating your APK. A single app can have multiple APKs. If your app includes an Android APK, first build your new APK, giving it a new versionCode in the app's Gradle build file. Important: In order for your app to update properly for existing users, the value of android:versionCode must be greater than that of the currently live version of your app. Additionally, your package name must remain the same as your previous APK. Sign in to the Developer Portal. From the Dashboard (the default homepage), under the Amazon Appstore section, click App List. The portal creates a new set of tabs for you. The General Information, Availability & Pricing, Description, Images & Multimedia, Content Rating, and APK Files tabs are shown with green checkmarks to indicate that the required fields have been pre-filled with the information associated with the live version your app. This information is simply copied from your live app. On the Description tab, a Release Notes field appears where you can describe the changes you've made in this release. Click Edit and add your release notes. Note that a set of release notes is required for each translation defined for your app. As desired, edit the information on the tabs. 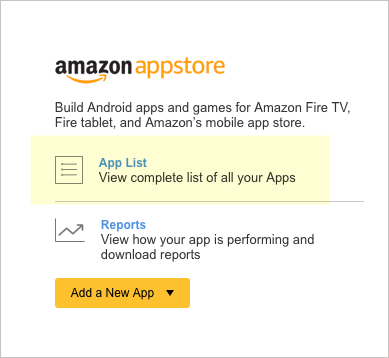 For details with each tab, see the documentation for Submitting Apps to the Amazon Appstore. Replace your previous APK: To replace your existing APK with a new file that supports the same devices, in the APK files section, click Replace. Replacing your APK allows you to retain all your previous Device Support settings as before. For example, if you already selected which devices your APK supports, and your new APK supports all the same devices, choose this replace option rather than reconfiguring your device support selections. Delete your previous APK: To delete your APK and all previous device support selections, click the Remove button next to your previous APK. Then upload a new APK and configure the Device Support selections from scratch. To change the devices your APK supports, click Edit next to "Supported Devices" in the APK File section and update the supported devices. Warning: If you choose to delete your APK, remember that you have to reconfigure which devices your new APK file supports. Otherwise, you might be pushing out a new app that is inadvertently supported on devices that you either don't support or don't want to support. For apps with multiple APKs: Suppose you have multiple APKs for your app. If you want different APKs to support different devices, you must first clear any devices from the first APK that you want the second APK to support. After you clear the devices from the first APK, these devices become selectable options in the second APK. More detail is provided in Add Multiple APKs for the Same App (in Step 7: Upload APK Files). See also Multiple APKs for the Same Application Listing. Note that when you add APKs for new devices, customers using the app on previously supported devices will not receive an app update. Web apps: For web apps, you will see an App Files tab rather than an APK Files tab. On the App Files tab, update your web app files as desired. When you're finished making updates on every tab, as long as the information is complete, green check marks appear on the tabs. When all tabs for your app have green check marks, the Submit App button is enabled. You can change the information on any tab until you submit your app. Note: If you start to create a new version of your app but decide not to publish the update, you can delete the unpublished version. Use the Delete Upcoming Version button (at the bottom of the page) to roll back to the currently published version of the app. Apps with API levels lower than Marshmallow (less than Level 23) require customers to manually approve the updates before the updates can be applied. For these updates, Fire TV sends an actionable heads-up notification every 24 hours letting customers know about pending approvals for updates. These notifications also stay in the Notification Center and take customers to a screen that shows all the pending updates. When customers launch an app that has a manual update pending, Fire TV shows a message that asks if customers want to update the app first before launching it. If customers decline, Fire TV does not prompt customers to update the app on subsequent launches for another seven days. If customers go to the app details page, an update button appears for apps that have a pending update.